Protect Facebook accounts from hackers Guide by Hackingloops : Most of our users have asked us about that how to protect Facebook accounts from Hackers. Facebook is most used Social Networking platform and its always on target for hackers. But on the same side, Facebook’s internal security is good enough that 90% of hack attempts don’t succeed. Facebook itself continuously working on security and new techniques to protect Facebook accounts from Hackers. But there are some scenarios which Facebook cannot protect Facebook accounts because these require user’s awareness in order to protect Facebook accounts. Facebook cannot prevent your account from Social Engineering attacks, honey traps and freebie luring as all these things require user awareness. Today we will discuss all techniques or traps which hackers can use to hack your Facebook account passwords and how we can protect Facebook accounts against these traps. So let’s begin.. Note: This tutorial will be helpful for every Social Network and Even Securing Email accounts and its a must read for all Hackingloops users. This is most important step to protect Facebook accounts. Below are some points listed which you need to update for securing your Facebook account. Create Strong Passwords so that it cannot be easily guessed and it should be familiar enough that you can type it real quick, so that someone cannot shoulder smurf or see it while you are typing. Always use a combination of uppercase, lowercase, number and special character combinations and try to keep it at least 8 characters long. I am not focusing much on length because brute force attacks wont work on Facebook, they already had protection for that. But always keep your passwords strong and avoid typing passwords in front of other people to avoid shoulder smurfing. Update your mobile number along with recovery email address. But why? Because now every time when you or someone change your password you will get a reset link on your mobile and recovery email address. Update your security questions to that it cannot be easily guessed. For example, choose a security question like what is your favorite city and answer it like your favorite car or some other code but never city. Update list of 5 trusted friends which can be used to recover your password with help of 3 friends. If you choose it wisely, then this 3 friend hack will never going to work as it will always show 3 friends out of your chosen list. You can also use 2 way authentication method which is called Activate login approvals in Facebook. But note that you will always need your mobile for this as it send a unique code on your mobile every time you attempt to login. Always unclick on Keep me login check box shown on login page. This will prevent your sessions to remain alive after certain period of time i.e. time till which Facebook persistent cookie will expire. Which usually expires when you close your browser or delete your history. Always Sign off after usage. These were some internal things. Now its time to discuss external techniques which hackers can use to hack your Facebook accounts. There are multiple social engineering techniques which hackers nowadays use in order to hack Facebook accounts or other Social Engineering accounts. Traditionally hackers use Phish or Fake pages to trap users to harvest their Facebook accounts passwords. But as technology getting advanced so do hackers, they are advancing even faster than technology. Below i will touch base latest Phishing techniques and techniques that hackers use and ways to protect Facebook accounts from those traps. Traditional Phish or Fake Pages : Hacker creates exact same copy of web pages and uploads them to some free web server and distributes its link via email, open chats, embed in images etc. But it is not that effective as most people are aware and look for URL in the URL address bar and when they find it different from actual one they don’t login and sometimes even report to authorities of Fake pages. So always check the URL before logging into your account. Social Login Traps : Nowadays you guys might have noticed that some sites provides a social login feature i.e. you can use your social networking account to login into their websites. Hackers are using this to trap users, they are setting up fake websites and provide some luring features likes coupon codes, freebie items, free full software’s, templates, themes, movies or music etc. Its normal tendency of human to go for such lures and they end up giving their credentials to malicious hackers. Tabnabbing Traps : Even more advanced phishing techniques in place in market nowadays. Hackers are creating malicious websites mentioned in above point and using meta refresh and auto redirect features to redirect users to their fake pages or phish pages to capture their login credentials. For example, hacker’s create malicious websites and put meta refresh tags and redirects on particular time intervals say 2 minutes or 5 minutes. When this time interval passes suddenly their fake page pops up asking you to login into your accounts. Emails with HTML and Word Docs : One more awesome attack practice hackers are nowadays using to trap users are by sending emails with HTML and DOCs as attachment. When user opens those attachments, a vb macro or meta refresh executes which pops up a fake social networking page and asks for your credentials. For example, hackers send emails for some lottery wins, job opportunities, offers to your emails having HMTL and DOC attachments and when you open these mails you end up sharing your login credentials with hackers. Freebie Traps : Have you guys ever give a thought that why anyone would provide you anything for free. For example, hack a software and share with you for free or upload a 2GB movie to some website or torrent and make it available for free , or even simpler purchase a music cd and upload songs to some website and provide it for free to you? Off course not. What they do is that they attach their malwares or spywares or Trojans or keyloggers with them with help of binders and when you download it, you compromises your machines with hackers which they can use for their purpose whenever they require. Most hackers spread their botnets with help of freebie traps and use your machines for their malicious works like DDOS attacks. So always avoid using torrent, free download websites if you want to remain secure. So in order to protect your Facebook accounts from hackers, you have to become smart, otherwise you will end up getting hacked. Keep Learning !! Keep Connected!! Don’t forget to comment if you love our article ” How to Protect Facebook Account from Hackers”. Today we will learn how to conduct Penetration testing of VoIP (Voice over IP) against a Private Branch Exchange as it’s must to perform pen tests for all type of attacks. For VoIP security assessment, most important pen test is Caller ID Spoofing and how hackers spoof caller ID to make fake calls on behalf of someone else without disclosing his/her information. Before starting pen test we have to understand what is Caller ID Spoofing? Caller ID spoofing is a type of attack where a malicious attacker will impersonate a legitimate SIP user to call other legitimate users on the voice network. So let’s learn how hackers spoof caller ID. Penetration testing of Caller ID Spoofing will require certain pre-requisties to perform complete VoIP pen test. Now Consider an attack scenario where a malicious attacker calling some customer by pretending that he is an CEO of some organization and he wish to verify some information from customer or want to transfer ABC amount to customer’s account like we see spam emails of huge money transfers and lottery winnings. The attacker is changing the header of the SIP INVITE request in order to spoof his caller ID to CEO. Customer accepts the call as the caller ID seems to be from CEO which is considered trusted and initiates the phone conversation with the attacker. Now let’s see how this type of attack can be conducted with the use of various tools. This will cause the phone device to ring with the custom message of our choice even from phone extensions that are not valid. The device will ring with showing caller ID as The Metasploit has you. In order for the attack to be successful the Private Branch Exchange needs to allow anonymous inbound SIP calls. 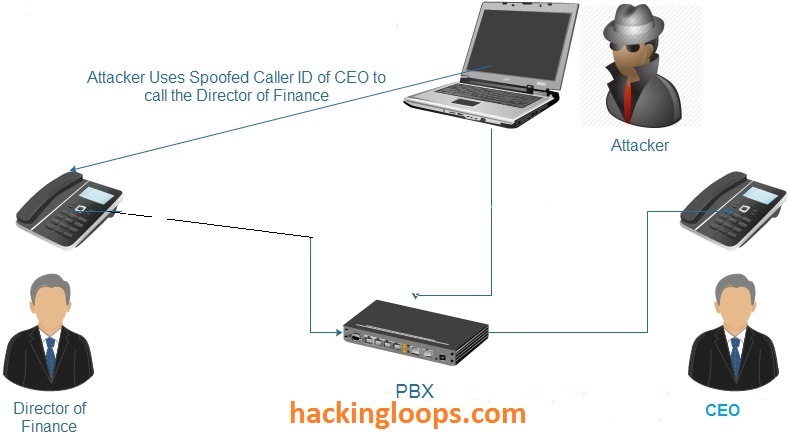 It is very easy to be implemented even from people with limited knowledge about VoIP and hacking. That’s why systems owners need to ensure that their Private Branch Exchange’s prevent anonymous inbound calls to reach their legitimate users in order to mitigate the risk of this attack.